Keen to join GrabRentals and our Exclusive Fleet Partners? Now’s the best time to do so! SIGN UP ASAP TO ENJOY THIS DEAL! Call us at 6801 4188 OR head on down to Grab @ Sin Ming to find out more with our friendly staff! He will be entitled to Level 1 & 2 allowing him to get a Mazda 3 for $48/day and also a 8% commission rebate when he rents from GrabRentals. Example: If Mr Tan earns $5000 a month. 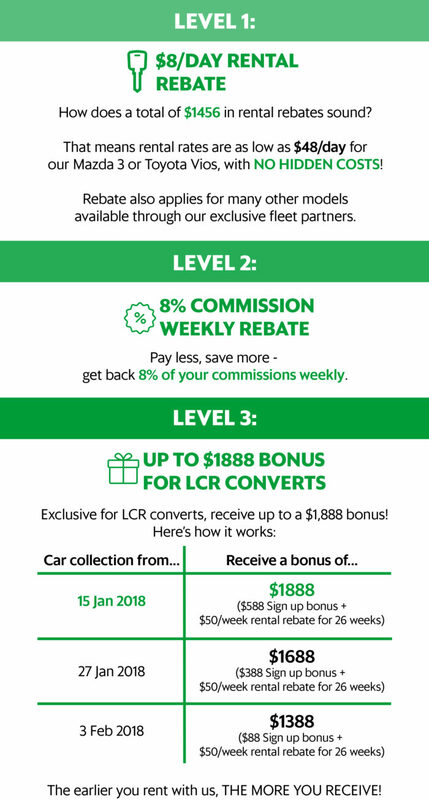 As a LCR renter, Mr Tan is eligible for an additional tier compared to non-LCR renters when he switches over to Grab Rentals or any exclusive fleet partners – allowing him to receive an additional $50 rental credits weekly. And because he signed up early, he received $588 as a sign up bonus. Example: Mr Ong earns $5,000 in a month. Who are GrabRentals’ exclusive partners? New to Grab Rentals & Exclusive Fleet Partners. Agree to be an exclusive driver with GrabCar and not use the rented vehicle for any commercial activity other than solely for the purpose of providing transportation services requested by passengers via the Grab App. The Triple Prosperity Deal is not stackable and cannot be enjoyed concurrently with GrabRentals Loyalty Rental Rebate, PowerUp, SteadyOne and Green Rental Rebate. The Triple Prosperity Deal is offered as a package and cannot be mixed and matched. Incentive payment will be paid weekly if the driver meets all qualifying criteria and requirement on the following week after the trip count start. 8% Commission Rebate is paid 80% in cash & 20% in credit. All GC Economy trips count towards the trip requirement targets, including GC 4 seater, 6 seater, GrabFamily, Grabshare & JustGrab. Within the same week, where the driver completes more than one trip booked by the same passenger, only the trip that occurs first will be counted towards the trip requirement targets. Driver must keep the acknowledgement email as a proof of Triple Prosperity Deal sign up. Grab reserves the right to make the final decision for any dispute that arise regarding Triple Prosperity Deal.